The first village to follow Sukhomajri's development model was Bunga, just 30 km away in Haryana's Panchkula district (see timeline: Divergent trajectories). Its success is on a surer footing for now, because it is not dependent on the forest department, but it still needs help from the government in the long term, which it isn't getting. Bunga's surrounding hills were denuded and alternating flash floods and droughts forced villagers, who reared goats and cultivated for subsistence, to adopt a nomadic lifestyle for eight months a year. Dairy farming is the mainstay for the 160-odd families, mostly marginal landowners or the landless: agriculture contributes only 35 per cent of the village's income; the rest comes from the sale of milk. Gujjars comprise 90 per cent of the village. There are 20 dalit households, of which five have small plots of land. In 1983, when cswcrti scientists showed the villagers the dams in Sukhomajri and offered help to build their own, they jumped at it. cswcrti provided technical expertise, while the state agriculture department implemented the project. Approved in 1983, the first dam and distribution network were completed next year for Rs 25 lakh. Two more dams were built in 1988 and 1990. hrms , set up in 1984, banned grazing and collection activities on the commons and initiated an afforestation programme to enable water harvesting. The catchment area of the first dam comprised 74.6 ha of land, owned by the forest department, and 79.9 ha of shamlat (village commons). The first signs of change started showing soon (see graph: High equilibrium). The total cultivable land in the village is 250 ha. Within a year of irrigation starting, in 1985, around 122 ha area received water. Now 170 ha is irrigated by the dam and tube wells irrigate around 40 ha. Replacing maize and arhar (Cajanus cajan), wheat and berseem (Trifolium alexandrinum), a water-intensive fodder crop, now cover the fields. Experiments with hybrid varieties were carried out on a 40-ha plot to boost yields. The yield per hectare has jumped from 900 kg to 3,000 kg for wheat and from 800 kg to 2,200 kg for maize with irrigation and hybrid varieties. Farmers also introduced new crops: rice, sugarcane and cotton. The livestock composition changed. The village had 800 cows, but later the number of buffaloes, requiring more feed and producing more milk, increased. The number of buffaloes, cows and bullocks has increased by 320, 47 and 33 per cent. Milk production has gone up from 1,100 litres a day to 4,000-5,000 litres. The surplus is sold at Rs 12 a litre. Regeneration of the commons brings in more profits from bhabbar and fodder. "Our yearly per capita income has risen to Rs 10,000 from almost nothing since the construction of the dam and the development of the commons," says Bhikha Ram, a former hrms president who owns 1.6 ha. hrms has appointed one person to supervise the distribution of water. His salary, Rs 4,000 a month, is more than the Sukhomajri hrms earns from selling water. Four underground pipelines have been laid: two with a roughly 13-cm (five-inch) diameter and one each of 10 cm (four inches) and 7.5 cm (three inches). The price of water hasn't changed from Rs 6 an hour from the five-inch pipeline, Rs 4 from the four-inch pipeline and Rs 3.50 from the three-inch pipeline. A progressive tariff ensures equity and efficiency, as do measures like calibrating the cropping pattern with water availability and not giving reservoir water to rice fields. Despite these there are problems. The revenue from water sales has dropped from Rs 28,975 in 1998-99 to around Rs 7,300 in 2007, because the reservoir has been silting up. Then there is the groundwater issue. "Prohibitions and bans on crops are not strictly imposed, but most cultivators heed the society's advice. There are farmers who can afford to irrigate fields with tube wells," says Gurnam Singh, the hrms president. Villagers are not unduly worried. "Electricity is erratic, automatically regulating use of tube wells. In any case, groundwater is used mainly in emergencies or to irrigate rice," says Bhikha Ram. Nine tube wells in the village supply water for irrigation. 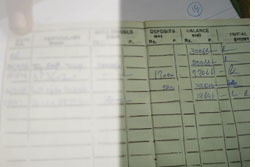 Arya found that 80 per cent was used by the owners' land. The 20 per cent that is sold covers capital costs in two years, making tube wells an easy option. The saving grace is the realization that the dam is more beneficial and the fact that the water table is still at a depth of close to 90 m.
Bunga is not a Sukhomajri rerun. Its hrms is more assertive, meeting at least once a month. Villagers usually follow its advice on cropping and water use. What has made this possible is that commons constitute more than half the catchment. hrms auctions bhabbar from its commons to contractors even after the paper industry's shift to wood pulp. Villagers buy fodder. In a year, the society earns Rs 60,000-70,000 from these, Rs 10,000 from water and Rs 12,000 from the fish in the reservoir. Over the past seven years, it has earned Rs 90,000 annually. It pays no taxes. hrms has spent Rs 12 lakh on development, welfare and maintenance. It shows: the distribution network is better managed than Sukhomajri's and the society maintains records regularly. The state government did try to grab revenue but failed. It passed the Haryana Amendment Act no. 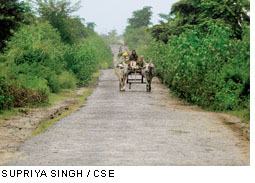 9 of 1992 to transfer revenues from village commons to panchayats. Since Bunga's dam was constructed on common land, this meant revenues from it and from sale of common resources would be the panchayat's. hrms sued and won (see box: Winning the war). Bunga has managed its water well, but it can't desilt its dams. Bhikha Ram used to plant maize, gram, groundnut and mustard before the dam was constructed. With increased yields, he now earns double the income from the monsoon maize crop and the rabi wheat. Despite this, he is worried. "The dam has silted now but the villagers lack the resources to de-silt it. We have approached the collector's office and the agriculture department, but to no avail," he says. Arya, too, is unhappy with the way the village has been abandoned. "As soon as a project is handed over to a village everyone forgets about it. Experience shows external intervention is needed in the form of help with technical and logistical problems," she says. Help has clearly not been forthcoming. Jag Pal Singh, assistant circle officer, Department of Agriculture, Haryana, says there is no separate fund for repairing or maintaining such structures. "The department might allocate funds if new schemes come to the area, otherwise we too are helpless," he says. There have been some problematic interventions. To prevent flooding, the forest department increased the height of the first dam in 2001 and 2006. As a result, the rabi crop gets less water. An earthen dam, funded by the European Union, was built in 2006 upstream of the first to reduce silting. It collapsed that year, causing more siltation. Nothing's been done about it.